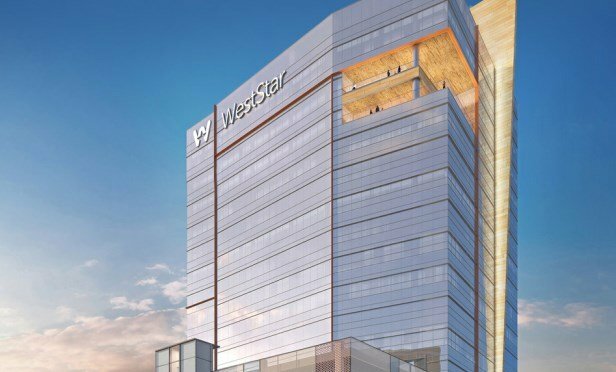 WestStar Tower encompasses the entire city block bordered by Mesa Street, Missouri Avenue, Oregon Street and Wyoming Avenue, and will be the tallest building in El Paso at 313 feet when completed. The project includes 262,000 square feet of office and 13,000 square feet of office and retail space. EL PASO, TX—The downtown skyline continues to change as construction on WestStar Tower at Hunt Plaza is well underway. Since the official groundbreaking in June 2018, crews have been working to clear the lot for WestStar Tower, which encompasses the entire city block bordered by Mesa Street, Missouri Avenue, Oregon Street and Wyoming Avenue. When completed, the multi-tenant multi-level office building will be the tallest building in El Paso at 313 feet. Between now and early 2019, progress will be made on the following parts of the project: column formation and placement which support level two (the first elevated deck); formation of the level two garage deck; installation of the mechanical, electrical and plumbing aspects in slab or which penetrate slab; structural steel reinforcement and post-tensioning for the slab; anchor embeds which will support the curtain wall glazing; placement of portions of the second-level deck; ramp from ground level on Missouri Street into the parking structure; and column line supports for level three (before all of the level two deck is completed). The overall project will include approximately 262,000 rentable square feet of true class-A space and 13,000 square feet of ground level office and retail space. On the ground level, the outdoor Hunt Plaza will feature green space with outdoor seating and dining, which will also serve as a venue for community events. Occupying a full city block, the building will offer proximity to area amenities such as Southwest University Park, the Museum District, San Jacinto Plaza and the new El Paso streetcar system. The office building will serve as the corporate headquarters for Hunt, occupying three floors of the building with about 170 employees. The Hunt Family Foundation will also be located in the building. It will also serve as the corporate headquarters for WestStar, which will occupy three floors and will also have a commercial bank operation on the ground floor. WestStar and its affiliates will have approximately 260 employees working in the new location. The building will offer approximately 850 parking spaces.